In the opening scene of L'Ebreo, Giovanni Barba, a love-struck bachelor, and his best friend Girolamo Amieri jump into the midst of an ongoing story. 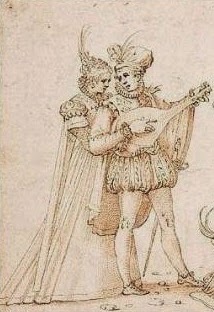 Scena seconda, Giovanni Barba e Girolamo Amieri. Giovanni: Che di tu, Girolamo? Non ti par ella una bella fanciulla? Non mi son io abbattuto bene? Non ho io fatto un bel parentado? woman - proposing instead this quick cut to the main action. These eligible young men enthuse over Giovanni’s recent engagement to the beautiful Oretta Tolosini - daughter and sole heir of the rich merchant Alamanno Tolosini. 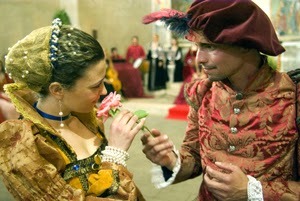 Girolamo offers practical advice on how to woo girls and win the favor of their families. I recently cast this opening scene in English, doing my best to convey the rhythm and - above all - the humor of the original. In Italian, L'Ebreo is often a very funny play, so it needs to be funny in English also! Melchisedec the Jew does not appear until later in the play. Then, he emerges as a strange, exotic and sometimes unsettling element in an otherwise breezy romantic comedy. You can click below to refresh your memory regarding the general story line of L'Ebreo. Later, I will post a few more scenes - revealing Melchisedec as both an onstage and an offstage presence. Giovanni Barba: So, Girolamo, what do you say? Isn’t Oretta a great looking girl? And haven’t I lucked out, making this match? Girolamo Amieri: Sure! Sure! It’s all good! Just don’t lose sight of the money. Gold coins stay beautiful forever and never grow old. In fact, the more you handle them, the brighter they shine. And money—unlike wives—won’t eat you out of house and home. Instead, you can watch your cash devour other people—the ones, you know, who pay you interest. And, yes! Seven thousand scudi is a fine dowry. Giovanni: Best of all, I like the free and easy way we did this deal—especially since I’m just a new guy in town. Her old man, I hear, has already deposited a thousand scudi in the Guidolotti bank. So now, I’m good to go. 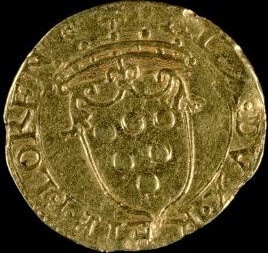 Gold scudo with Medici arms. Girolamo: That’s the way to make marriages! We shouldn’t be wheeling and dealing in the market place, faking and feinting and bluffing each other out. Finding a wife isn’t like buying a load of goods—taking the stuff and never seeing the seller again. When aspiring in-laws start playing tricks, we know right off that they have plenty to hide. And when family alliances begin with everyone on their guard, their guard is going to stay up forever. Giovanni: What can I say, Girolamo? You know the score. But in my case, the pieces fell right into place. Messer Alamanno is a good old man and his family, the Tolosini, is fine and noble. Best of all, their habits and customs are just like mine, so their lifestyle is everything a gentleman could wish. The Tolosini household is wonderfully free of pomp and pretence—with none of the old-fashioned crudity that infests the homes of the elderly. Last thing I need is a doddering geezer who can’t get over the good old days—packed and ready to go rushing back. Girolamo: Tell me about it! Unless something has been gathering dust for fifty years, you might as well save your breath. They eat on wooden trenchers and won’t even look at good tin plates. They hang those long towels by the sink, collecting everyone’s handprints from week to week. You might as well be living in a dog-eared booklet of household tips from way back when. But above all—I’m warning you—don’t get between old guys and their wine! They want it right there on the table in front of them—not decently offered by the servants. Giovanni: Then, whatever the season, they amble around in flat-heeled slippers with open toes. And if they want to look stylish, they stuff a big old handkerchief up their sleeve and tuck their gloves into their waistband. Girolamo: Enough, Giovanni! Enough! No one can say that you haven’t done well for yourself. Everyone in Florence is singing your praises. Giovanni: Now listen, I’ve been thinking… I want to call on Oretta tonight and seal our engagement, taking her hand in mine. So naturally, I need you and all my friends to come along. Girolamo: Oh?! You’ve seen her yourself already—on your own? Giovanni: How could I? They’re still drafting the marriage contract. Girolamo: So, now you want to pop up on her doorstep—Surprise! Surprise!—dragging along everyone you’ve ever known? Giovanni: Is there a problem? Girolamo: Not if you like disasters! I can see Oretta’s folks gritting their teeth—pretending they’re thrilled to see you. But where, in this picture, is Giovanni Barba? Girolamo: We’re talking about your first visit. So, you need to slip in and make nice to your bride—whispering sweet nothings in her ear. Then—as soon as she’s gotten used to you—you get busy glad-handing everyone in the house. Girolamo: Just imagine the scene… Hug, hug! Kiss, kiss! Father! Mother! Wife! And meanwhile, your buddies are shuffling around, bumping into furniture, tripping over each other’s feet. Keep it simple, Giovannni! Jump right in! Take charge! Let the Tolosini know that you're there to stay! Giovanni: Whew! After all that, will you at least have dinner with me with me this evening? Giovanni: You were there for me, Girolamo, every step of the way, in all of my matrimonial adventures—especially the crazy ones. Girolamo: When it comes to crazy, I can read you lectures straight from the professor’s chair. But for every scheme I remember, I have forgotten two—and that’s God’s own mercy. Decrepit in-laws with wild obsessions? Been there! Done it! How about anxious widows, pious church ladies, obnoxious younger brothers, idle chatterers, pompous jerks, misers, scroungers and miscellaneous nut-cases? At your service! But whatever you do and wherever you go, you should always have a kinsman watching your back. Giovanni: Kinsmen? Well, I can’t claim even one of those. 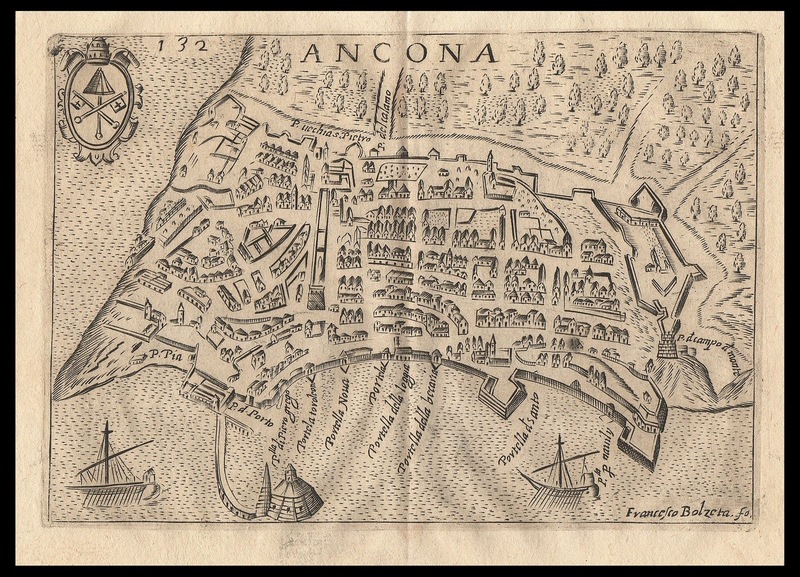 I was just a boy when I left Florence for the port of Ancona, to make my fortune with the Alberighi firm. I had neither kith nor kin nor property of any kind. Back then, I was only 21 years old and now I am 43. So, even if I misplaced a cousin or two along the way, they’re not hanging around, waiting for me to find them. 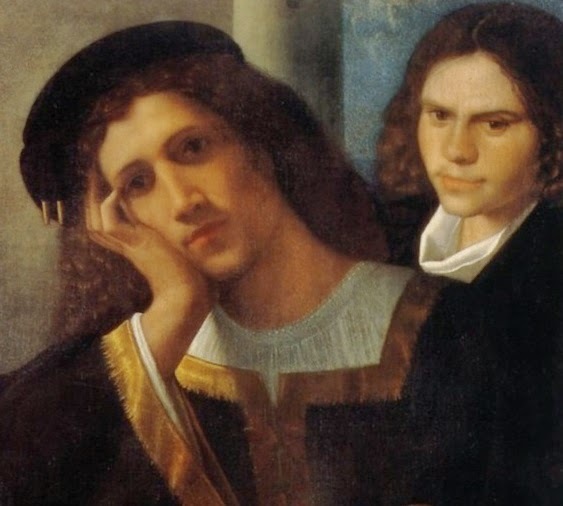 You, Girolamo, are my closest relation, through the sacred bonds of friendship. I wouldn’t have it any other way. Girolamo: 43? You’re 43? I would have guessed 37, maybe 38 on a bad day. Just keep that little number to yourself. Girolamo: You want the girl to find out? Giovanni: So what if she does?! Look at me, Girolamo! I’m still in the game! I can do everything I could ten years ago. 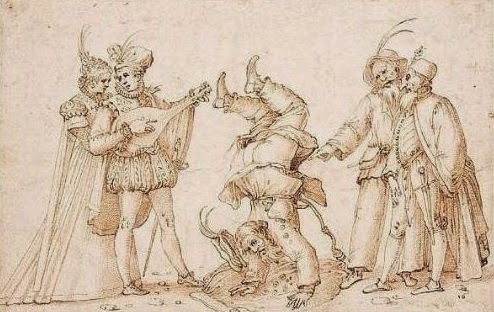 Girolamo: Yeah, great! Congratulations! Meanwhile, Oretta is barely 18. Giovanni: What is a decade or two, anyway? I have always looked after myself—eating well and sleeping well. Girolamo: Once you get married, you can forget about sleeping well. Then, after six or eight years of that, we will see what you are good for. Giovanni: Right here in Florence, I can show you lots of men who are fifty, if a day, settling down with fresh young wives. Girolamo: You can also show me lots of young widows making up for lost time. Dressing and behaving…well, you’ve seen them yourself. The minute their husbands check out, they launch second careers as public scandals. But buck up, Giovanni! I'm not saying that you are old. Heaven forbid! I am only saying that you look younger than your years—and what’s wrong with that? But now, we’re wasting time! Go pay your respects to Messer Alamanno. Take along anyone you want, since you don’t have a stash of relatives tucked away. But get in there—this instant—and start buttering up your father-in-law. Throw your arms around him, lay your head on his shoulder, congratulate yourself on being able to call him “Dad”. Then, you’re off and running. Giovanni: I’ll visit him at home this very second. And also, I can start in with Monna Dianora, my mother-in-law. Giovanni: How did this get so complicated? Girolamo: Relax! There are plenty of trinkets in town… I know! Let’s head to Ponte Vecchio–right this minute. With that mob of goldsmiths and jewelers, someone will have just the thing. Then—off you go!—straight to the Tolosini home. 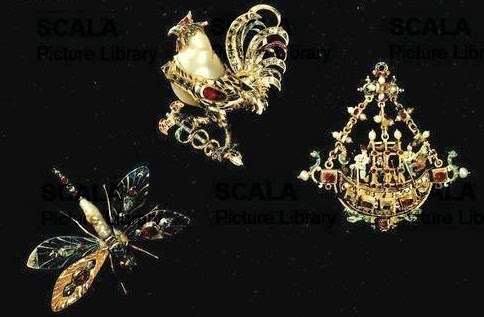 Jewelry from late 16th century Florence. Giovanni: You lost me back at “hold your horses”. Girolamo: Point one: You’re not springing up on Oretta’s doorstep with a rag-tag crew. Point two: You’re arriving in style with a stunning gift. So, listen up, Girolamo—and learn! This is how marriages are made. Begin with vague pleasantries—the vaguer the better. Then before you know it, you win the bride’s heart and her mother’s favor and the good will of all the women in the house. Just keep things light and avoid serious discussions like the plague. Girolamo: I won’t say that women prefer raging lunatics, but nothing kills tender feelings quicker than wisdom and reason in a man. What’s the worst news you can give a young girl? Just tell her that you are marrying her to a distinguished Doctor of Something or Other from the university—or anyone who is serious by profession. Who can blame the poor thing? 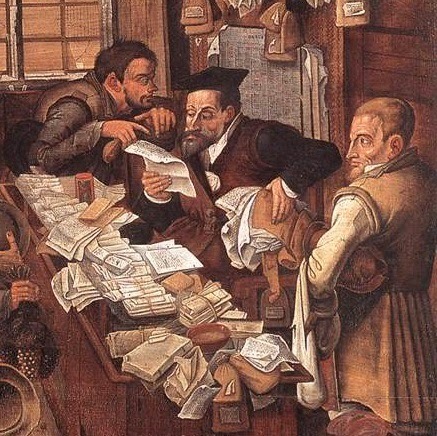 Imagine spending your life amidst heaps of books, frayed professorial robes, and a perpetual muttering of Latin? “Quam quam, this!” “Quam quam, that!” Imagine sitting upright and attentive at the dinner table, day after day, eating little and laughing less? 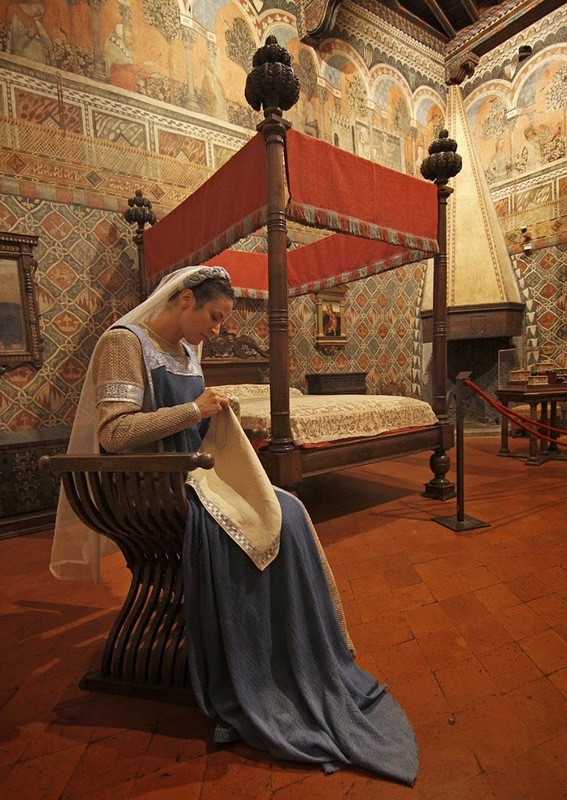 And lets not even mention the bedchamber! Any sane woman would run screaming from the room. Giovanni: But Oretta will be pleased, if I do what you say? Girolamo: Lighten up, Giovanni! You must be in love! Now, let’s get ourselves to Ponte Vecchio. The vendors will welcome you with open arms. Then it’s Oretta’s turn. Giovanni: I’m right behind you, Girolamo! Off we go! Jewelers' shops today on the Ponte Vecchio.